Do you ever verify that the amount due per your landlord’s invoice is correct? Sure, you can “wing it” by checking for reasonableness. But while you can fairly assume that the amounts due per the landlord is correct, can you really afford to count on it? If you only have one lease, an error might be easy to catch. However, when you have multiple leases, a small error can be a big deal. Consider this: a $200 error in ONE LEASE results in over $12,000 in extra payments over a 5 year period. 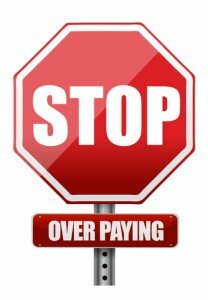 Want to think again before paying that lease payment without verifying its accuracy? If you have leases with annual increases, the amount of the increase per the landlord may not match the amount on the actual lease contract. Once again, if you only have one lease, this may be easy to catch. However, when you have over 20 leases, recalculating the escalation for all your leases per the actual lease contracts, comparing those amounts to the landlord’s invoice, and finally paying the correct amount due before it is late could be a very taxing exercise. This is especially true because the lease escalations all happen at different times during the year. Often leases can have certain months of free rent. Most of the time the free rent is at the beginning of the lease, for instance, no rent due in the first 6 months, but sometimes the free rent comes at odd months during the lease. For instance, the lease could say the free rent is on the anniversary of the lease (the 12th, 24th, 36th months, etc. ), or on some other random months. Random free rent periods are VERY difficult to remember, even if you have only one lease. In fact, LeaseQuery.com saved a client $23,800 on ONE LEASE under a scenario just like this! This is one that we’re all guilty of. We miss opportunities to renew the lease under favorable terms because we forget to notify the landlord within the notice period specified in the lease, causing our rent payments to increase. Sure, it may not increase by much, but recall my earlier point: A “small” monthly increase of $200 over a typical 5 year lease results in $12,000 in additional payments. Ouch! Ahh, CAM; the great real estate burial ground. Everyone has suspected at one point or another that they are being overcharged for CAM, but barring a full scale CAM audit, there is no way to verify that you are being charged the correct amount. Numerous unqualified expenses could be buried in there. Large corporations avoid these issues by using enterprise software to manage their leases, but small businesses and franchisees had to rely on excel spreadsheets…until now. With LeaseQuery, you can manage all your leases, track payments (including CAM), get notifications for critical dates like renewals and expirations, record accounting entries and pull reports. Best of all, you can access all this information from anywhere with an internet connection, and it is VERY affordable. Try us now, your first 5 leases are free. www.LeaseQuery.com; the small business solution for lease management. George, you hit it out of the park with this one. Good job and very illustrative and to the point on the pitfalls. So common and good thing there is LeaseQuery to help them!